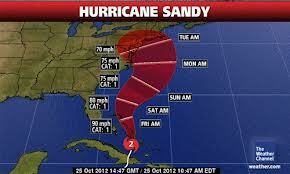 Hurricane Sandy is the child of Global Warming. 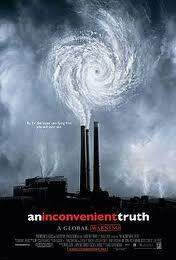 That "Inconvenient Truth". Such a subtropical storm is upon us in late October along the eastern seaboard of the United States. Hurricane Sandy is expected to make a sudden leftward upper cut swing off the usual course hurricanes take following the Gulf Stream to the northeast and heavily impact New York City. Inundated and slammed also will be the heavily populated and low lying coastlines of New Jersey, Long Island and New England with initial hurricane winds of 81 mph and storm surges amped up by the gravitational pull of a full Moon on Monday (Moon’s day). A still from the motion picture "The Day After Tomorrow". This is not implying that Sandy will flood like this, but you will see such storms in the next few years as Neptune draws into Pisces and generates the greatest record storm surges and floods in recorded history between now and 2026. We are facing uncharted waters, as it were, in climate change. If you have been following the meteorologists from North America and Europe, they have chorused the same observation that we are in unknown territory. Never has a static high pressure settled over the Gulf Stream blocking the pathway of hurricanes to the northeast causing one to hit a high pressure wall and ricochet westward into the Atlantic Seaboard states in a head on collision with an Arctic blast and winter storm. It is unique to these times of globally warming climate changes that hurricanes can take on a subcontinental size. Sandy, like Hurricane Irene, will make landfall as a Category One hurricane yet because of the sheer size and duration of the expected cyclonic storm, it will wreak havoc beyond what that category means. Sandy will be far larger and far worse than Irene that passed over the same area a little more than a year before as one of the top ten most expensive natural disasters in US history. The balance of nature will be lost, when the ocean tides shall obey no shore. 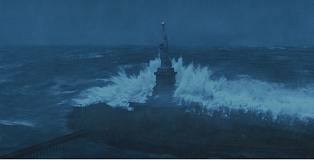 Still from the motion picture "The Day After Tomorrow". The sea will heave itself beyond its bounds engulfing mighty cities. And there will be signs in the sun, and the moon and stars; and on Earth the nations will be in anguish and perplexity and confusion at the roaring of the sea. [After the advent of] the great Comet [perhaps Halley’s Comet in 1986 or 2062 or Hale-Bopp in 1997]…the great nation [clearly described as America in her predictions] will be devastated by earthquakes, storms, and great waves of water, causing much want and plagues. 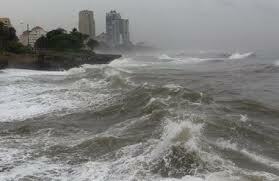 The ocean will also flood many other countries, so that all coastal cities will live in fear, with many destroyed. 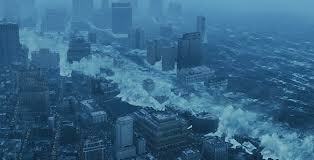 Still from "The Day after Tomorrow". …and when the seas rise…every soul will know what it hath made ready [for the Judgment day]. Mother Nature is at war with out stupidity, that pollutes her ecosystem to the point that fever chills of a large winter storm will collide with the fever heat and sweats of a subtropical storm over an area inhabited by 50 million Americans this Monday through Thursday. If the worst-case forecasts of a collision of storms hold true we do not really know what will happen when hurricane hot and winter cold storms collide. A hurricane slamming into a Nor’easter over the states of New York, New England, New Jersey, Pennsylvania, West Virginia, the Chesapeake States, the teaming millions living in Washington DC, Philadelphia, New York City! Think of it, people. What will happen when a foot of rain falls in 36 hours and the flooding Hudson River along New York City, the Delaware River alongside Philadelphia and the Potomac River beside Washington DC meet the storm surges of Hurricane Sandy? Where will the water go but backflow into your homes, your businesses, your White House, your United Nations, your Wall Street, your submerged subways of New York. What will happen when Sandy’s odd mix of tropical winds at sea level sharply contrast surprisingly more powerful hurricane force winds aloft blowing just a few hundred feet higher? They will shriek soon for three days and nights through the angular mountain ranges of hollow mountains of New York skyscrapers and their angular canyons of boulevards, speeding ever faster through narrowing gauntlets of streets. Thousands upon thousands of New York skyscraper windows will buckle and shatter, peppering the devil winds in their race down flooded avenues with the deadly spice of shredded glass. What will happen when a hurricane mix of wet tropical air raises “Kane” with Arctic air coming out of Canada to feed a winter front? It is not just going to dump a foot of snow along a two hundred mile stretch of the Appalachian Mountains. What happens when mere cold air collides with invisible subtropical air from the Gulf of Mexico in the early spring? The meeting of the two in far less violent contact gives birth to ranks of thunderstorms. 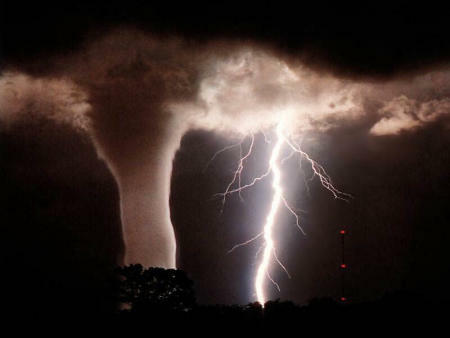 The tornadic dance of cold and tropically warm air spin supercell tornadoes across the central plains and southern US states. Meteorologists anticipate Sandy will make land fall with a low pressure in the 940s, breaking all records held in New York and New Jersey for low pressure. Sandy will come ashore 20-millibar degrees lower than any recorded low pressure system straying that far into northern latitudes from the tropics. No one really can say what will happen when a deep low-pressure hurricane of warm wet air hits a winter snowstorm because there is no record of it. There is no memory of a high-pressure system sitting stationary over the North Atlantic ever becoming strong enough to block a hurricane like Sandy, but one is about to. By midnight Eastern Time Monday, it will throw Sandy 90 degrees off course into the densely populated region of the United States to mate with a winter storm. We have no past history to judge these new phenomena but we do have “future history” as described by the prophets of many eras as we have seen listed above. Over a decade of accelerating, spiraling power in tropical storms, in monsoons and in tornado seasons is on the way. Neither human denial, or rationalizations of this being merely a “new normal” as if it “is” normal, nor feckless pledges to maybe renew some climate change accord to begin making serious cuts in fossil fuel emissions starting in 2020 are all mutterings of a soon to be drowning fool’s fantasy. Time is running out on stanching this flood from the angry skies and roiling rising oceans. Climate change will be irreversible in five years. The atmosphere heats up and holds more water, making all storms, temperate, arctic, or tropical, increasingly Neptunian Kraken-Loch Ness Monster powerful. That’s what climatologists across the world are coming to understand, reading the rise in carbon emissions in the atmosphere. There’s a point where rapidly growing and expanding use of fossil fuels will take us beyond a point where climate change is reversible. My twentieth book is published and all advance donators were sent their copy before its release on 19 October. Already it is receiving rave reviews from readers who patiently waited for this epic sized and fully illustrated e-book since began lining up with their contributions in late March of this year. 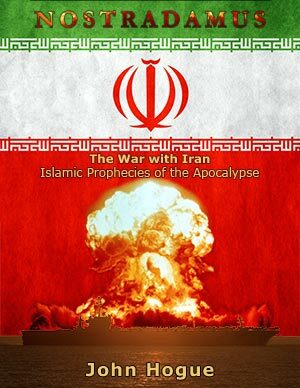 In general, they tell me it was “well worth the wait” to take this journey through the remarkably clear predictions of Nostradamus concerning and even dating the next window for war erupting between the Western powers and Israel against Iran. Moreover, I endeavor to match Nostradamus’ foresight with that of many Islamic seers. Their visions are rarely introduced to Western readers, until now. We passed the last astrological time window for war in the middle of the last decade, yet since that time, the strident and enduring alarms sent by readers of Hogueprophecy as well as those clanged and spun by mainstream news media have tried to pressure me to withdraw my oracle’s constant message. Sabers will rattle, US and Israeli leaders will threaten, Iranian leaders will counter-bluff the apocalyptic consequences if there is a war with Iran. I will not withdraw my oracle’s message through the years: this war is not going to happen in 2009, or 2010, or 2011, or even this year of 2012. I explain in detail in my eBook why all the lose talk of war will not lead to the loosening of missiles and warships in the Persian Gulf in 2012. I hope you will read it. 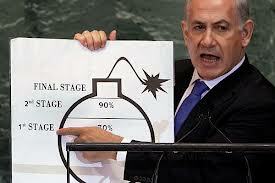 Netanyahu and his cartoon bomb, harranging for war before the United Nations General Assembly. Not long after I signed off on the visions and interpretations in Nostradamus: the War with Iran, empirical developments took place in Israel that for the record I will say closes the door of preemptive war so bellowed and threatened by Israeli Prime Minister Binyamin Netanyahu for the last year-and-ranting. His government’s coalition is collapsing, forcing Netanyahu to call for emergency national elections in January 2013. War is off the table for now. There will be no war in 2012; however, after 2012 my oracle definitely does not sustain confidence in that continued abeyance. Reading this e-book can help you understand what is coming, why it has been so long planned and how who wins the US presidential elections does not matter when it comes to 20 years of planning and momentum gaining for an Iran strike. This book shines a light of new interpretation on prophecies of Nostradamus and the Islamic world so such a future can be avoided and suggests how we can prevent it from happening. That is why the email I got today from Carolyn, inspired the following interchange. I feel it was so important that I share it with you, my extended Hogueprophecy community around the world. Thanks John – But I am a believer in what you focus on you manifest – so I try not to read anything about war! Hi Carolyn. A few things to meditate on. First off, a “belief” is a qualified ignorance. It is not a “knowing”. It is faith based, borrowed from others. It is not an organic intelligence deep inside of us. So, with that said, what we believe we manifest through our focus presumes an awareness of who we are consciously, which is often not possible because we have not truly looked deep into ourselves beyond our borrowed identity and conditioning by society. We presume we are clear in this manifesting when for the most part this is an illusion. How can the blind “see”? Cartoon from the 1900s depicting the pervasive anti-Semitism of Europe where all the crowned heads of Europe blame everything on the Jews. Finally, if we think that avoiding reading about war will somehow keep war out of our lives, look what happened to the Jewish communities in Europe during the 1930s and 1940s. If you study the years leading up and through the Jewish Holocaust, you will find that Jewish community leaders across Europe stifled any talk about Hitler actually threatening the existence of Jews in Europe. Those few Jews who pointed out that the Nazis aimed to exterminate the Jewish people were judged as alarmists. They were either silenced or their warnings were shrugged off by people who believed, like you, that what you focus on you manifest. The element of collective denial of the dangers coming to the Jewish communities of Europe was an important factor in their near annihilation in Europe. Denial in the guise of positive thinking aided Adolf Hitler and his henchmen. One of the subtlest tricks of the programmed mind is to hide from one’s awareness a deep negativity towards negativity in the name of ever manifesting positive thoughts. It is better to face life’s negative potentials openly and with full awareness so that they can be prevented. That is why I it is a positive response to face the dangers of a potential war coming with Iran. It is good to understand the motivations of this war, that planning of it, and what could be the consequences to everyone living on this Earth if it happens. I prefer to focus and manifest “understanding” concerning the unconscious things we individually and collectively do, because only that will shine a light of revelation on our negativity so that we can transcend it. So, I cordially and lovingly ask that you manifest consciousness, Carolyn. To do that, one must face openly and sensitively all dimensions of life: good, bad, war or peace. Always remember that whatsoever you dislike, face it. And whatsoever you would like to avoid, never avoid. Whatsoever you are afraid of – go into it. That’s the only way to finish it; otherwise, it will haunt you like a shadow. 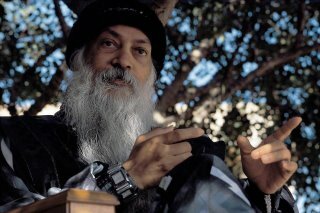 If these words of Osho resonate with you, then I invite you: accept my gift of information and links to the meditations I use on my path to inner transformation. Click on Contact Me and leave just one word: Meditation. I will then send you the information by email. I do know as long as I focus on the positive my blessings increase. It is hard, but it has worked – FOR ME!! I will work on dealing with the rest of life – thanks for the information. Carolyn. And that is good. I would only propose for your meditation that sometimes the art of living requires we balance our accentuating the positive with facing those negative things we avoid. If you have no issues with war, then that is fine. For me, I would ever test this by looking into it. If there is no issue, how can testing that by reading, let’s say, my eBook on Iran, be an issue unless there is avoidance happening? The book has one of my most uplifting endings I have every had write “through me”. You may be missing something very beautiful hidden in a book about war. A new year is coming. Time for my oracle’s forecasts for the year 2013. Your advance donation of $12.50 or more will help me make that book possible. You will then be on the list to receive the special donator’s edition of Predictions for 2013 that will have special features only seen by those who contribute in advance to its creation. At this moment, I am looking at my very packed schedule, which after releasing the Iran e-book has me feverishly working to finish an e-book that will be my last word on the 2012 Mayan Calendar Prophecies by 21 December 2012. While juggling that deadline I hope to have Predictions for 2013 ready for download to advance donators starting around New Year’s Eve or no later than early in January 2013 before it becomes a “purchase only” product without the special features. 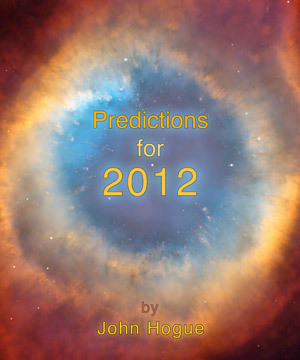 Please reserve a copy with your donation by clicking on Predictions for 2013. Be sure you put 2013 in the window for notes on the Paypal page. Specify which book you want and that helps me focus my energy on completing the e-book rather than tracking you down to find out what book your donation is for: the War with Iran, or Nostradamus 2012, or my prophecies for 2013. This entry was posted in Global Warming and tagged 2012, Al Gore, Brigham Young, climate change, Delaware RIver, Emelda Scochy, Frankenstorm, Global deluge, Halloween Hurricane, Hitler, Hogue, Hudson River, hurricane force winds, Hurricane Irene, Hurricane Sandy, Iran, Iranian prediction, Islamic prophecies, Israel, Jesus, Madame Sylvia, Mayan Calendar, Me Generation, Meditation, Meditation - the first and last freedom, Middle East, Mohammed, Muhammad, Neptune in Pisces, Netanyahu, New York City, Nostradamus, Nostradamus Iranian prediction, Nostradamus: 2012, Osho, Philadelphia, Potomac River, prediction, predictions, predictions for 2012, Predictions for 2013, prophecies, prophecy, prophet, Quetzalcoatl, St. Hildegard, storm surge, tornado, tornadoes, tropical storm, tropical storm winds, US presidential elections, war with Iran, Washington DC, Y'shua, Yeshua. Bookmark the permalink. Post a comment or leave a trackback: Trackback URL. Assad will fall from power before the summer of 2014 and Russia’s and Iran’s army will likely be destroyed when attacking Israel in 2017. Check Rapture Forums. 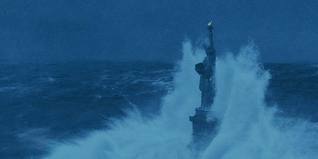 I could not help but think about the movie The Day After Tomorrow when I first heard about this storm, even before I read your latest e-mail. I remember that movie scaring me more than any possible scenario I had ever heard of, because it was so in the realm of something that could happen. It looks like the Weather Channel people will be right about what will happen to New York City when this hurricane hits them – they were rather blase about the last time they got hit, which basically turned out to be not so bad. I don’t think think they are going to be so lucky with this one. I say that history repeats itself, I think it is human nature, we have the means to NOT go down this rocky road to selfdestruction. People are to petty, involved with themselves, to grasp the big picture, by then it will be to late. Dennis, you also forgot so ill-informed it is scary. People are so wrapped up in the themselves and the draw of celebrity and the “them” vs “us” mentality that they cannot even see what is really going on in the world and right in front of their faces. If people do not wake up and shake themselves out of their own self-important world, God will allow the destruction of America nd the world…and that means 4 more years of Barack Obama and nastier hurricanes and natural disasters. Yes, I believe Barack Obama is a judgement on America. We have 6 days to get it together..or else….4 more years of judgement.